Evernote is useful enough on its own. So, too, are many of the apps you’ve downloaded to your smartphone or tablet. But these two great things get even better when they’re brought together—and many of them are. Plenty of apps feature direct links to Evernote, making your digital life just a little easier. Here’s the lowdown on three of them. Dispatch lets you share messages—including attachments—directly to Evernote. This email app is centered around what it calls “action-based email.” And that’s true: Rather than serving as a simple repository for your messages, Dispatch helps you take action with the information you receive. In many ways, Dispatch is similar to Mailbox, the email app offered by Dropbbox. Both Dispatch and Mailbox take advantage of your phone’s touchscreen to let you swipe messages to your archive or trash, and both are centered around the idea of getting to inbox zero—that fabled (for me, anyway) state of a completely empty inbox. But on a couple of key points, Mailbox proved preferable. Mailbox is available for both Android and iOS, where Dispatch is iOS only—and is designed for the iPhone, though it will work on an iPad. Mailbox is free, where Dispatch costs $5. And Mailbox lets you choose between deleting a message and archiving it with the length of your swipe. Dispatch lets you archive a message with a long swipe, but in order to delete it, you have to swipe and then tap a trash icon—a relatively minor step that becomes inconvenient when trying to delete messages en masse. Dispatch does offer some time-savers that Mailbox lacks, however, including the ability to save snippets of text that you can use to populate your reply messages. And I like how it fills in a greeting and signature (both of which you can change) on your replies—speeding things right along. Dispatch also makes it really easy to undo accidental deletions—something the iOS email app really lacks. But where Dispatch really shines is its Evernote integration. I find it odd that Mailbox—from the people who make Dropbox—lacks any true Dropbox integration. Meanwhile, Dispatch—a third-party app—features tight integration with Evernote. Link the two apps, and you can save emails and attachments directly to your Evernote account. 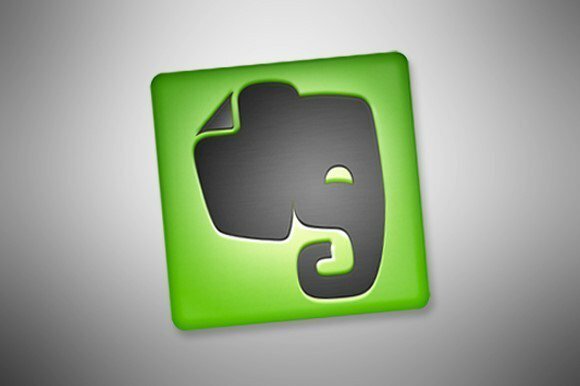 Die-hard Evernote fans will find $5 a small price to pay for an app that offers this this incredibly handy feature. Hullomail’s free version is supported by ads, which crowd an already-busy screen. Chances are, your voicemail messages are chock-full of important information. And, chances are, these messages are tied to your smartphone, stuck permanently on your mobile device. But not with HulloMail. This Android, Blackberry, and iOS app lets you do more with your voicemail messages, though just how much you can do depends on how much you’re willing to pay for it. HulloMail works on Android, BlackBerry, and iOS devices, and is available in a free (ad-supported) version, as well as a $9 Premium version. But if you expect the Premium version to include all of the apps features, think again: Some of its most useful features still require in-app purchases. 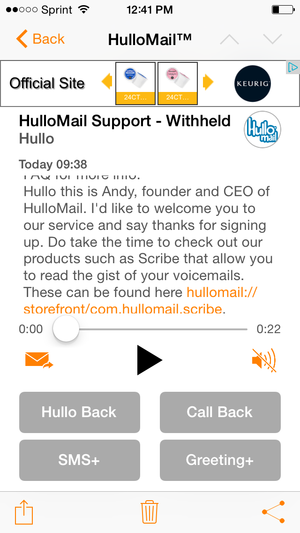 HulloMail says it allows you to “read, play, and manage your voicemail on your smartphone, in your email, and via the Web.” And it does, to a certain extent. Install the app, activate it by dialing a number from your phone, record your greeting (if you so desire), and you’re good to go. The free version of HulloMail lets you manage and play your messages from your phone or the Web, send a copy of them to your email or Facebook, and record a voice message to send to someone else. The $9 Premium version removes the ads, lets you record individual greetings for different contacts, and automatically sends a copy of your voicemail to your email. It also offers Evernote integration—something I truly wish was available for free. If you pony up the money for the paid version, you can store the MP3 recordings of your voicemails in Evernote, which is a handy way to access them again in the future. Handier still is HulloMail’s “Get the Gist” Scribe service, which transcribes the first 10 seconds of your messages into text so that you can decide whether it’s worth listening to the rest. Even with the paid app, you still have to pay for Scribe, which will run you about $2 per month. Scribe would be more useful if it transcribed entire messages, and if it were included in the paid app. The ability to read voicemails as text and save them to Evernote would be fantastic. As it stands, though, HulloMail is just moderately useful. 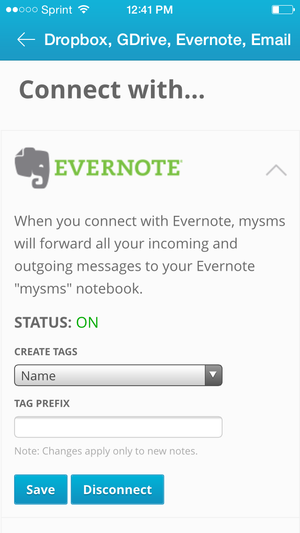 Connecting your mysms account to Evernote is a snap; you also can easily create tags. Whether you love it or hate it, you can’t deny the power of texting—especially when it comes to business. More and more, professional communication isn’t being done over the phone or over email, it’s being done via text message. That makes it more important than ever to have a reliable solution for composing, sending, and storing text messages. Enter mysms. At its heart, mysms is an app that allows you to text on your smartphone, your tablet, and your computer—wherever it’s most convenient for you. It’s a free app that you install on your phone and your tablet (Android, iOS, or Windows) and on your desktop (Mac or PC). Once installed, you can text other mysms users for free, though business contacts may balk at having to download a new app in order to do so. If you’re using an iPhone, your mobile texting options end there, as Apple does not allow a third-party app access to your text messages. If you’re using an Android phone, mysms has more freedom, and it can be used to manage all of your texts. It becomes even more useful on the desktop, where you can send and receive texts using the spacious real estate of your computer monitor. All conversations that you have on the desktop are synced to your mobile device, and vice versa. iPhone users will likely find Apple’s restrictions too cinfining to make mysms of much use, especially in a professional setting. But if you’re an Android aficionado, the combination of mysms and Evernote should prove a win-win.